The Feast of the Holy Family is on the Sunday between Christmas and the Feast of Holy Mary, Mother of God (1st January). It is an important feast, not only because of the role it played in our redemption but also the fact that it is still the model of a Christian family, even today. Ten years ago, Blessed Pope John Paul II expressed his wishes for today’s families to have ‘the peace, harmony and love of the house in Nazareth.’ It is not to mean that the Holy family did not experience problems. Already before Joseph and Mary were together she became pregnant and Joseph was in great confusion and wanted to divorce her quietly until he had a dream and the angel of the Lord invited him to take her in his house. When the child was about to be born, the family could not find a room in the entire village of Bethlehem. When Jesus was presented in the Temple, the prophet Simeon told Mary that her heart would be pierced by a sword. Later, when Herod heard that a child was born to become King, he tried to kill him and the family had to go to Egypt. 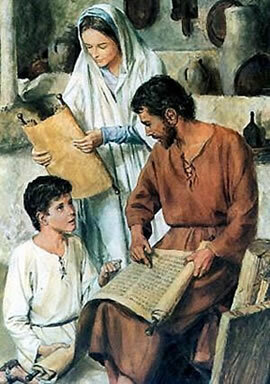 When Jesus was twelve years old, the parents lost him in the Temple of Jerusalem. It is highly probable that Joseph’s business had some financial problems as it is the case for poor families in occupied territories where the conquered people have to pay taxes to the occupier. Pope John Paul II said that those qualities of the Holy families (despite the hardships they went through) would help today’s families ‘overcome trials and difficulties [they] encounter on [their] way’. Among other current issues dealt by Church authorities, family issues have taken an important place. The Holy Family of Nazareth is the ideal of a Christian family even though we all recognise the fact that many families do not look much like the Holy Family and are still good families. The United Kingdom is also very much affected by the family breakdown. Many children are raised by a single mother, a single father or in other kinds of households where the traditional setting ‘father-mother-children’ does not obviously appear. Today, several children have had more than two fathers or mothers by the time they leave the family house for studies, jobs or other commitments. Most of the time those children become very decent, responsible members of the society. However, they often have to go through extra pains while growing up. It may also destroy their future completely. The Holy Family still inspires indeed. It went through many problems that have always been experienced by families: homelessness, poverty, doubt, confusion, persecution, exile, occupation of their land by a foreign army, heavy laws imposed by corrupted leaders, etc. The fact that it kept its dignity and became the ideal family for all Christians depended on the harmonious relationship and love between Joseph to Mary and Jesus. Just as prayed Blessed John Paul II in 2002, ‘let us entrust to the Holy Family of Nazareth the families of the whole world, especially those that have been most harshly tried by suffering or are in difficulty’.